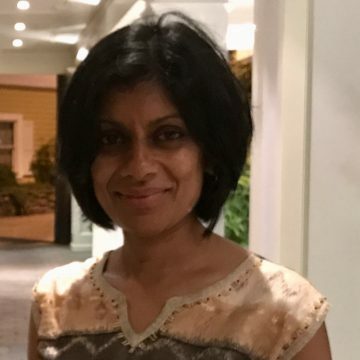 Nisha Purushotham is a facilitator, coach, and cultural worker who works with mission-centered organizations seeking to strengthen their practices of healing justice, equity, and inclusion. As a movement fundraiser, she partners with frontline-led organizations to secure the resources they need to sustain and grow movements of justice and liberation. Her current and former organizational partners include SISTA Fire, New England United for Justice, Community Labor United, Alternatives for Community and Environment, Direct Action for Rights and Equality, and the Network of Immigrant and African American Solidarity. In September 2018, Nisha began leading IISC’s coaching strategy within the DOHMH’s Center for Health Equity. Through this strategy, the IISC seeks to support staff of the Race to Justice Management Team and the Bureau of Division Management in integrating coaching practices into their equity work. Prior to her work as an independent consultant, Nisha was an organizer for The Rhode Island Organizing Project in Providence, RI and The Center for Community Action in Robeson County, NC, supporting frontline leaders in building campaigns and trainings around affordable housing, health equity, and youth leadership development. Nisha is also writer, singer-songwriter, and world percussionist who has studied Afro-Caribbean percussion with master drummers in the U.S. and Cuba. For over a decade, she designed and facilitated interdisciplinary drumming workshops for young people in urban schools and prisons that aimed to build intercultural community, nurture creativity, and examine the role of drumming in cultural survival and resistance. Nisha is a board member of the Resist Foundation providing guidance for the organization’s mutual support and accountability practices.